Rohm RG 3 Silver Gun | Easter Weekend Sale! Trigger Pull: The trigger pull on the RG-300 and RG 3 is double action only and a bit on the heavy side so you will need to hold the gun firm and apply an even and long pull to fire the these blank guns, after a few shots you get the hang of it. If you do not pull the trigger the entire way back until the hammer releases, the shot will not fire but the blank will index and move onto the next round so you may have an unused blank when you pull out the magazine. 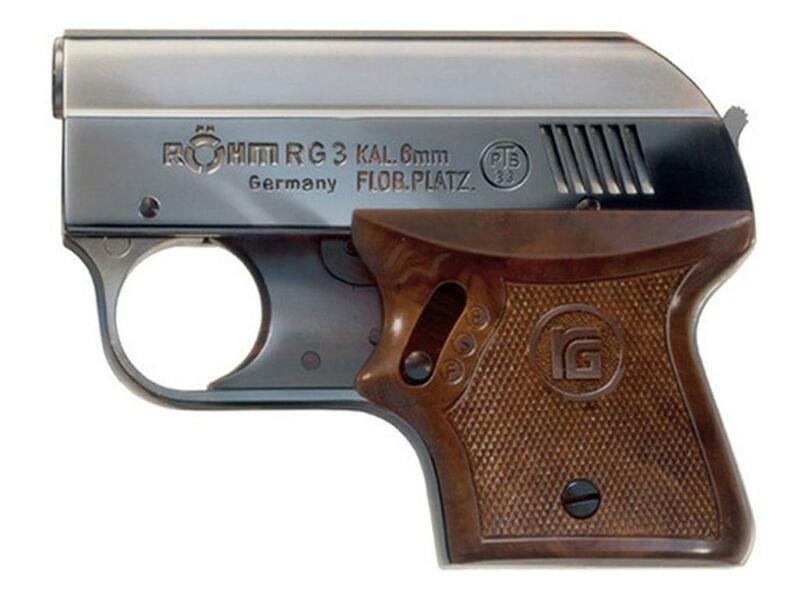 Build Quality: The overall build quality for the ROHM RG-300 and RG 3 blank pistols is very good, being German made they are built to last and the fit and finish is very good. The only real plastic would be the grips on both models which is to be expected. Both guns worked perfectly for me during my testing and with the exception of a bit of a heavy DOA trigger pull since the trigger first has to index the magazine and then fire the round. Realism: The ROHM RG-300 and ROHM RG 3 are not exact replicas of any given guns in production as this would make importing them into Canada even more difficult. The ROHM RG-300 does however share some similarities in looks to that of a Sig Sauer but in a much smaller form factor ! Very safe double action triggers, will not accidentally misfire on you. Available for import into Canada. Double action trigger pull is a bit tough and takes some getting used to. Comments: One nice point with the .22 caliber blank shooters is the lower cost to shoot them, .22 caliber crimped blanks work out to be much cheaper than the 8mm & 9mm P.A.K. or .380 crimped blanks. Sure they are a bit quieter but louder than you might think, especially when coming out of a short barrel. Another selling point is how compact both of these guns really are which makes them easy to pack around if you want to take one with you on a hike or outing as a deterrent for any wildlife that may get a bit too close to you. The RG-300 and RG 3 are two very nice additions to the ROHM blank guns.